Our bathroom is 1970s green (more sage than avocado) with a plastic sauna ceiling,gold taps on the corner bath and a freestanding shower so compact that, if you don’t hold your elbows in close to your head when washing your hair, you risk getting wedged between the walls. When we moved in I was adamant it would be the first room we decorated, but two years later there’s no plan to decorate it and it will more likely be the last room in the house to get done. That’s okay, I’ve got used to it. The main thing that annoys me about it now is how often the spindle of the loo roll holder falls out and gets stuck behind the radiator. So until funds permit maybe I’ll just change the loo roll holder. Nothing nice will go with our 1970s bathroom so I’m not even going to try to find something that will blend in. Instead I can use the toilet roll holder as a basis for the new design of the bathroom. But what to choose? Traditional, simple, vintage or modern? This traditional style metal and wood toilet roll holder from Rockett St George at £32 is really pretty. It looks more like an old-fashioned letterbox, I’m expecting to see ‘LETTERS’ embossed on a flap where the spindle is. A simple ceramic toilet paper holder that says what it is, just in case. £20 from Rockett St George and you can get matching items like a soap dish, toothbrush holder and hand soap dispenser. 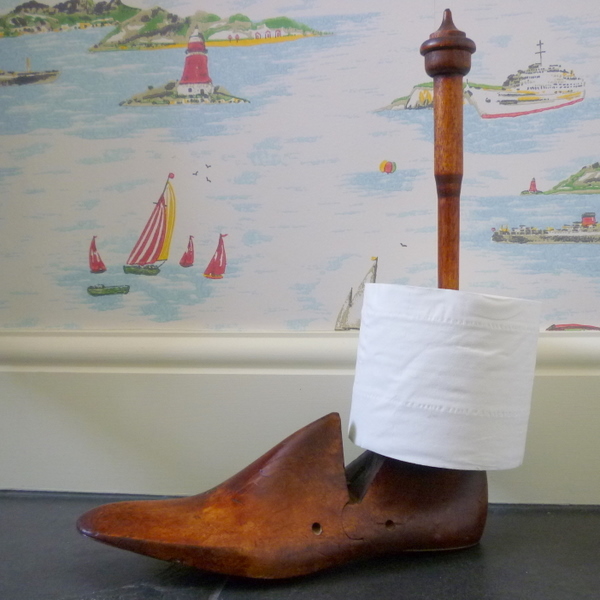 The patina of the wood on this vintage toilet roll holder made from cobbler’s shoe lasts is beautiful. £25 from Homes and Dreams. It looks the same as their doorstop so maybe you could buy one and double its use? Or perhaps I should go modern with the Paper Pot by AI Collection, $40 from Molla Space. It can also be used with tissues as a tissue box. There’s lots of colours – bright orange, pink, blue, green, black or white and the toilet roll is encased in the pot so it’s a good way to avoid another pet hate of mine, damp toilet paper.